This article is about the microgame in WarioWare: Twisted!. 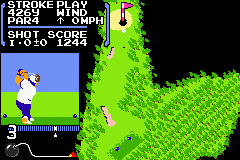 For the NES game, see Golf. Info "Get the ball on the green!" Golf is one of 9-Volt's microgames in WarioWare: Twisted! It is set in the NES game of the same name. The object game is to hit the ball onto the green by swinging the course around during the swing. It is even possible to get a Hole-in-One. Level 1: The course is fairly curved. Level 2: The course is very curved. Level 3: The course is full of islands and water hazards. This page was last edited on October 29, 2018, at 21:24.